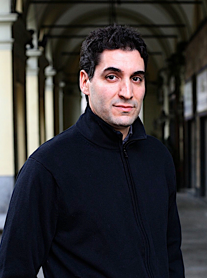 Saïd Sayrafiezadeh’s short stories and personal essays have appeared in The New Yorker, The Paris Review, Granta, and The New York Times Magazine, among other publications. He is the author of the acclaimed memoir, When Skateboards Will Be Free, for which he received a 2010 Whiting Writers’ Award. It was selected as one of the ten best books of 2009 by Dwight Garner of The New York Times. His short story collection will be published next year by The Dial Press. He answers a few questions for me on writing, revision and kleptomania. I’m going to start with the fact that I loved your piece in The New Yorker this week. I loved the very individual step into war. What brought you to write this piece, specifically? It was a combination of things. First of all, I wanted to write something in response to the general glorification of the American soldier and the romanticization of war. Have you seen Lara Logan interviewing soldiers on 60 Minutes? But I was also interested in sensitively depicting my main character’s struggle with life and love. Which is to say, I didn’t have a political agenda when writing this piece. I grew up in the Socialist Workers Party and polemics come very easy to me. Everything was always supposed to be done with the working-class revolution in mind. I’m not interested in polemics as a writer. I have to guard against them. They can infect and cheapen stories. So as much as I was motivated by depicting a different version of war than what we’re accustomed to seeing, I wasn’t compelled to speak directly about current events. Recognizable details would bog the story down. I wanted general war, every war, all war. And I wanted a character with a very real life and very real aspirations. Characters must always trump politics. How do you cull and revise a short story? Do they come out of you looking like they do? Or is there a painstaking in-between? Each one is different, but they’re always guaranteed to have a “painstaking in-between.” Or many painstaking in-betweens. This last New Yorker story I visualized almost entirely before writing it. I knew what was going to happen at the end, and this helped me significantly because I knew in which direction I was going. The end informed everything. But I’m not always so lucky. Sometimes I have to figure out on the fly what’s going to happen. There’s always a desperate moment where I find I’m nearing the end of the story and I’ve got to try to tie everything together or all will be lost. But the plot, of course, is just one element of a story. The details are just as important, and it can take a while to come up with those small specifics that will bring the piece alive for the reader. Timberland boots, for example, in the last story. Rhythm is also important for me. I want my sentences to move quickly and rhythmically. No wasted gestures. I spend a lot of time on this. It’s probably where half of my energy and obsession goes. But in the final product, none of this labor should be apparent to the reader. It should seem effortless. So the Timberland boots came into “Brief Encounter” in a later draft? You are right that they ground the story in the reader’s reality. Do you have other people help point out weak/strong points of a story when you have first written it? Or do you slog through revision on your own? It’s actually difficult for me to remember what happened when. I’m constantly revising as I go. In fact, I’m not sure what even constitutes an official draft. The Timberland boots definitely came in before I showed it to anyone. As much as I’d love outside input, I slog through by myself. It’s lonely and it’s full of doubt, but it seems an essential part of the process. When I finally get a completed story with which I feel somewhat content, I’ll show it to my wife. My wife is the only person who reads my work before I send it out to a publisher. She’s not a writer or an editor, which I think is a plus. She’s a visual artist, so she has an artistic sensibility, but she reads my work solely as a reader, solely as someone wanting to enjoy a story. Her advice is usually general and structural. I almost always take her advice. This is another significant difference with my experience as a playwright where I was accustomed to having staged readings of my plays. There was usually followed by audience feedback. I’d go home with twenty-five different opinions in my head and try to rewrite. That’s an impossible task. So I have to be careful about this and limit my intake. My wife weighs in first, and after that it’s my editor. How does this differ from the process you use to revise long-form writing, be it plays, memoirs, novels? In the case of plays, I’m not writing for the page but for the stage. In other words, I’m writing a blueprint so that others will be able to look at it and reconstruct the world. As much as I would like, I can’t become too enamored with the lines on the page. Instead, I have to imagine how it will appear in an entirely different form. Much of my revision in playwriting comes after I’ve seen it read aloud. That’s when I can clearly hear the mistakes. Sometimes they’re my mistakes, and sometimes they’re the actors. Sometimes it’s impossible to parse. Then there are all the other variables involved, like director and designer. It can be a maddeningly complicated medium to work in. Frustrating at times. The playwright is just one participant. Ultimately, the script is going to be interpreted (and misinterpreted) in different ways. All of these things, of course, are also what can make theatre so exhilarating. I owe much of my ability to write fiction to the fact that I’m also a playwright. I learned how to work within the constraints of time, i.e., a two-hour piece of theatre. And there’s a tempo that the audience desires, an economy of movement. I apply this to all my writing. Even books. You’ve written in pretty much every genre–plays, fiction, nonfiction. Is there a form of writing you prefer? What do the different forms offer you? I prefer them all. Poetry, too. In fiction, I like having the freedom from having to adhere so closely to facts. There’s a depth I can achieve that’s not always possible in nonfiction. I can embody other characters and other locales. The adage “write what you know” is not necessarily one that I subscribe to. In this sense, plays and stories are closely linked for me: they’re both fiction. But I’ve also liked using nonfiction to write directly about my personal experiences. I’m often asked if I ever considered turning my memoir into a novel. The answer is a resounding no. I wanted everyone to know that this is who I am and this is what I lived through. It was cathartic. Some of that immediacy can be lost in fiction. Your memoir When Skateboards Will Be Free explores, among other things, your Iranian heritage in contrast to your American identity. You said in an interview with PBS that your Iranian identity, in some respects, drove you to write, to “set the record straight about who [you are].” Was this primarily true for Skateboards or is this true in general of what brings you to writing? It still motivates me to some extent. I have a desire to assert myself as an American. My name precedes me, after all. I’ll always have to contend with that. To this end, my stories are about distinctly American people in American cities. Writing about my Iranian or Jewish background doesn’t interest, at least not in my fiction. It would be extremely limiting to confine my art to this narrow definition of how others see me. My memoir explored that subject in great detail, and it’s time for me to move on and do other things. This is the wonderful thing about writing, you can define yourself. For many years I worked as an actor and I was always called into audition for roles like cab driver and deli owner. It was humiliating, but there was nothing much I could do about it. That’s the nature of the entertainment industry. But I would never allow that to happen in my writing. I tell the reader who I am, not the other way around. There’s a bit in your memoir about going through phases of kleptomania. This makes sense from the anti-capitalist background it sprang from, but it also fascinates me because I see writers, in a way, as thieves. To write, you are constantly stealing details and ideas, sometimes even the drama of a story. Though perhaps this is less true of memoir than fiction. You’re absolutely right. The hope is that you can somehow remain original. Someone once gave me the good advice: find stories you like and then figure out what makes them work. I suppose this would be considered reverse engineering. But it’s also a form of theft. And accumulation. Here’s an example: years ago, when I was working at Martha Stewart Living, a friend described how a coworker sat at her desk in front of her computer pretending to work. “Click, drag, drop,” he said, describing her. In my New Yorker story, I borrowed that exact line. “Click, drag, drop.” It stayed with me for ten years and I finally got to use it for something. But in memoir, it’s true, you’re on your own. The material is already there, and you have to figure out how to use it. It’s like walking the tight rope without a safety net. There’s nothing to catch you if you run out of ideas. Who do you consider to be the biggest influences on your work, literary or otherwise? It’s not so easy to pinpoint. There are probably as many important negative influences on my work as there are positive. The Socialist Workers Party has to be a big influence, politics simmer in everything I write. So does paranoia. My mother’s lifelong struggle with depression no doubt gave me a certain sensibility. Also, her own aspiration to be a writer…never fully realized. On the other hand, my uncle Mark Harris—Bang the Drum Slowly—was very much a success. My father leaving home when I was nine months must figure into my artistic outlook somehow. As would growing up in Pittsburgh after the collapse of the steel industry. As would growing up with lots of black friends. There are also some easy answers, too: Kafka, Beckett and James Baldwin. They turned their alienation into art. Hitchcock turned paranoia into art. Chaplin turned poverty into art. Howard Stern turned talking about masturbation into art. That’s brave. And that’s the artists’ job: to say things that other people can’t. How does living in New York affect your writing? Do you find it an inspiring place to live and work? Do you ever feel you are over-stimulated here? I would never have made it as a writer if I hadn’t moved here from Pittsburgh. New York City showed me that it was possible to make a living in the arts. In Pittsburgh, it would only ever have been a hobby. The opportunities are endless in this city. So are the people you can meet. One of my most important friendships is with the writer Thomas Beller who I met playing basketball on Horatio Street in the West Village. He was one of the first people to publish me. No, I don’t find the city over-stimulating. I find it alive. Besides, it’s easy enough just to stay in my apartment and watch television, which I often do. There’s nothing more comforting than knowing that waiting right outside the door is the greatest city in the world. This was touched upon earlier, but to ask a question slightly adjacent–why do you write?